The World Health Organization (WHO) has rated cardiovascular diseases (CVDs) as the number one cause of deaths across the world, claiming more than 17.7 million people in 2015 and the number is poised to increase consistently in the near future. Thankfully, collaboration of science and technology has led to the advent of devices that can efficiently monitor and diagnose the development of a disorder in the circulatory system including the heart and blood vessels. And, as healthcare infrastructure improves across developed and emerging economies, the uptake of these devices is anticipated to accelerate. According to this business intelligence study, the demand in the global cardiovascular monitoring and diagnostic devices market will increment at an impressive CAGR of 6.5% during the forecast period of 2017 to 2024. The analyst of the report has estimated that there will be opportunities worth US$3,629.5 in the market for devices that can monitor and diagnose cardiovascular system across the world by the end of 2024, substantially more than its evaluated valuation of 2,329.7 mn as of 2017. Apart from the strong prevalence of cardiovascular diseases as a result of tobacco use, obesity, and unhealthy diet, improving health insurance portfolio of urban populations, and technological advancements, the cardiovascular monitoring and diagnostic devices market stands to gain additional traction from increasing geriatric population and growing concept of medical tourism. On the other hand, substantially high cost of these devices are keeping them away from a potent chunk of consumer base. Additionally, lack of adequate reimbursement policies in several underdeveloped countries is a challenge in front of the prosperity of this market. Nevertheless, the vendors stand to gain from the introduction of wearable and advanced medical devices such as implantable loop recorders for cardiovascular monitoring. On the basis of product type, the market for cardiovascular monitoring and diagnostic devices has been segmented into ECG systems including resting and stress, diagnostic catheters, ECG management systems, implantable loop recorders, holder monitors, and event monitors. Among these, the sub-segments of ECG systems collectively provided for a demand that was worth US$1,075.1 mn in 2017, which was more than double of the next fruitful segment of holter monitors. ECG system, which is a diagnostic tool used to assess the electrical and muscular functions of the heart, observes rate and rhythm of the heartbeat, blood flow to the heart muscle, and diagnoses heart attacks. ECG is the most preferred technique used across the world for the diagnosis of cardiovascular disease due to cost effectiveness and high efficiency in cardiac treatment. By the end of 2024, the segment is poised to attain a valuation of US$1,662.7 mn. Most of this potential demand for ECG system is expected out of developing countries owing to their cost factors, safety of procedure, and painlessness. On the other hand, holder monitors are expected to sustain their position as second most profitable region until 2024, generating a revenue of US$792.7 mn. A holter monitor continuously perceives various electrical activities of the cardiovascular system and records ECG of arrythmia patients consistently. It is also used to detect conduction block in auricles and ventricles. Increasing number of cases of arrhythmia and conduction block is the major factor driving the market for Holter monitor. Geographically, the report has evaluated the potential of demand for cardiovascular monitoring and diagnostic devices that can be expected out of North America, Europe, Asia Pacific, Latin America, and Rest of the World. According to the American Heart Association, the Centers for Disease Control and Prevention and the National Institutes of Health, cardiovascular disease is the leading cause of death across the globe and the number is expected to reach up to over 23.6 million by 2030. North America was the largest market for cardiovascular monitoring and diagnostic devices in 2017. The region is likely to sustain its leadership position up to 2024, promising for a demand worth of US$1,389.0 mn. High incidence of cardiovascular diseases, better reimbursement policies, modern health care facilities, efficient health care infrastructure, and high awareness among patients and physicians are the major factors driving the market in the region. However, the demand for devices that diagnose and monitor cardiovascular system is projected to grow at the fastest CAGR of 7.6% during 2017 to 2024 from Asia Pacific. The Asia Pacific market is estimated to be worth US$749.1 mn by 2024, which can be attributed due to increasing prevalence of cardiovascular diseases, rising awareness and presence of unexplored opportunities in India, China, and other countries in Southeast Asia. Patient hospitality services and proper knowledge of handling of devices by surgeons play an important role in mobility of patients as well as growth of the cardiovascular monitoring and diagnostic devices market. Medtronic PLC, Boston Scientific Corporation, GE Healthcare, LivaNova PLC, Philips Healthcare, Siemens Healthcare, and St. Jude Medical, Inc. are a few leading companies of this market that have been profiled in this BI report on the cardiovascular monitoring and diagnostic devices market. The rising prevalence of chronic disease and the increasing geriatric population are propelling the global market for cardiovascular monitoring and diagnostic devices. Government, research, and healthcare bodies are focusing on the treatment of various cardiovascular diseases. The increased interest and investments from these bodies are fueling the development in the treatments of these generic diseases. The increasing number of people suffering from diabetes and obesity, heart muscle weakening, and increasing risks related to hypertension are other factors driving the market. Technological advancements have provided the devices with portability in conducting tests, which is further adding benefits to the market growth. 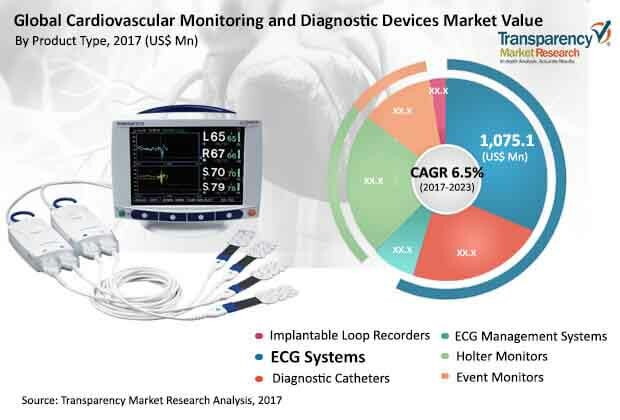 The overall market for cardiovascular monitoring and diagnostic devices is witnessing considerable expansion across various product segments such as ECG Systems, Event Monitors, Holter Monitors, Implantable Loop Recorders, and ECG Management Systems. Of these, the ECG Systems segments is expected to dominate the overall market over the forthcoming years. The report on the cardiovascular monitoring and diagnostic devices market offers a detailed assessment of key factors influencing the market, such as opportunities, challenges, trends, restraints, and drivers. The research report also provides company profiles of prominent market players operating in the market. The rising number of deaths due to cardiovascular diseases is the key factor driving the market for cardiovascular monitoring and diagnostic devices. Various companies are utilizing the latest technologies and innovating products to improve their efficiency and effectively. Numerous medical institutes are initiating research and development programs, which could help the market transform over the forthcoming years. Furthermore, governments and not-profit organizations are starting awareness increasing programs, which is further anticipated to increase the adoption of highly advanced equipment among consumers. It is expected that the rise in the geriatric population across the world will fuel the prevalence of cardiovascular diseases. The market is further anticipated to grow exponentially due to low cost of procedure and availability of reliable and affordable labor in the countries such as Turkey, India, China, and Indonesia. The growing consumptions of tobacco and alcohol, lack of physical activities, unhealthy food habits, and high level of stress are other factors leading to the risks of cardiovascular diseases. These factors ensure the healthy growth of the market for cardiovascular monitoring and diagnostic devices. Geographically, the global cardiovascular monitoring and diagnostic devices market can be segmented into Latin America, Asia Pacific, Europe, North America, and rest of the world. Among these, the North America market is anticipated to lead the global market due to factors such as advanced healthcare infrastructure, rising awareness among consumers pertaining the availability of treatment and diagnosis methods, and the favorable policies initiated by the governments in the region. The Europe segment is following North America and is close to North America in terms of revenue owing to high incidence of cardiovascular diseases within the region. The Middle East and Asia Pacific are most likely to present potential opportunities for the market to grow due to developing healthcare infrastructure and adoption of various varieties of cardiovascular monitoring and diagnostic devices. The market study presents profiling of prominent players operating in the global cardiovascular monitoring and diagnostic devices market. Key players in this market include GE Healthcare, Philips Healthcare, Spacelabs Healthcare, St. Jude Medical Inc., and Siemens Healthcare.